No you cannot. What are you smoking? Just as many question the pricing of the mini as it is. On one hand you have those who say the mini is not complete without a dedicated GPU, on the other you have those saying it's too expensive. How can Apple satisfy both camps? The answer is to provide a method of adding a GPU so those who don't need or want it don't have to pay for it but those who do still have the option. That method is an external GPU via Thunderbolt. This has some advantages even beyond flexible pricing. There is no place my setting for a giant box like the old aluminum Mac Pro, but a mini, external GPU, and external storage can all sit next to each other on a bookshelf. I wind up with the same net result, but in a much more adaptable physical form. Using modular components this way may not be what we're used to, but it strikes me as a pretty good idea. I get that, it's not what I'm asking. Is the Thunderbolt port attached to the GPU or the motherboard? i.e. does the video processing need to take a route back to the CPU in order to get out of the machine and to the display? And if it does, and you can have DisplayPort off the GPU instead, would that be more efficient than running from Thunderbolt off the motherboard? The TB3 port is not directly attached to the GPU. It has a separate controller chip on the Main Logicboard. It would be silly to run the TB3 port through the GPU as its not always used for video. 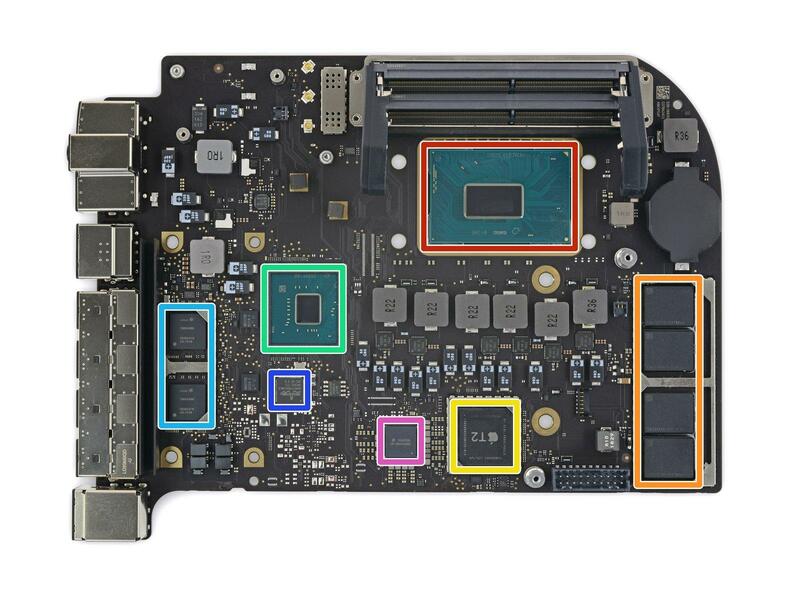 In the attached photo via iFixit, the cyan blue are the TB3 controller chips on this particular Main Logicboard from the 2018 Mac mini. Time to take off the tinfoil hat, inductive charging doesn't involve wifi and wifi isn't cooking your head or whatever. You taking down the radio towers in your neighborhood as well? Do you want to tell him about the EM fields radiating around his wiring or should I? Probably better to start him off with a minor shock like that before we get into the myriad radiations bombarding the Earth from space. Doesn't Intel have a new scalable processor coming this year? I was gonna post instructions on how to turn his house into a Faraday cage. This is just 2 Xeon® Platinum 8160 Processor "Glued" together , and the price will be more then MAC PRO itself :-). the New Chiplet design is very cheap to manufacture (small chiplets- high yields) versues massive monolithic 24c Xeon. The 10nm parts will be slower then current advanced 14nm+++, so we need to wait 10nm+ or ever 10nm++(2020/2021?) to get real improvement based on what tech reviewer found. So, what do you think that Apple will launch with the new Mac Pro in 2019? simply using current top of the like i9-9980XE 18C @ $2000 with Vega VII and upgrade-able memory will be enough? I found out the hard way that stucco is a good start. It attaches to the wall with steel mesh. Even without careful grounding and continuity it does a remarkably good job of attenuating RF! LTE signal strength drops by half just stepping inside from the back yard. Ok, so as I suspected, and my original question stands. Though tbh I've lot interest myself at this point.